6646 Elegant Tern Pl. Real Santa’s mailbox for the kids and treats nightly. Santa writes back a free personalized letter to each child. Free community event Dec. 17 with cotton candy, crafts, bubbles and a special guest. Dec. 3-25, 5-10 pm. 2160 Reo Dr. 14th year of decorating. Nov. 21-Dec. 31, 7pm-midnight. On Dec. 17, free cookies and cocoa, 6:30-9 pm and Santa will be there from 6:30-8 pm. Garrison St. & Chatsworth. Off Rosecrans. “Garrison Street Lights”. Dec. 1-31. dusk-10 pm. 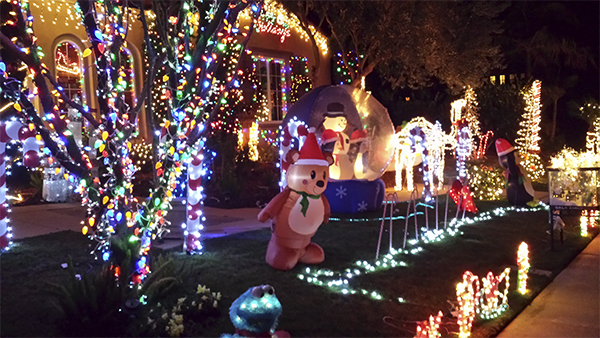 13518 Appaloosa Dr. 48 channels of lights dancing to 88.1 FM. Dec. 1-Jan. 1, 5-10 pm.